While studying hard can prepare you to be a good teacher, there are several inherent characteristics that make you a great preschool teacher. For example, you can learn how to effectively teach preschool curriculum and create a welcoming classroom, but showing enthusiasm for your students’ education needs to come from the heart. If you have a burning desire to make a real difference in the lives of young children, you have one of the most important qualities of a great preschool teacher. There will be many days when teaching feels extra difficult. Whether the pay seems too low or the parents act ungrateful, getting through the low points of teaching can be overwhelming. However, when you have a true passion for educating young children, your positive drive will sustain you through the hard times. Along with an undying passion for teaching, great preschool educators need plenty of patience. Every class has students with different developmental skills. Especially with young children, constant reminders about manners, hygiene and classroom procedures are part of a typical school day. From slow learners to behavioral challenges, it takes patience to keep the classroom environment balanced and in order. On top of that, working with demanding administrators, difficult parents or other teachers requires additional patience outside the classroom. Great preschool teachers understand how to keep their cool under many different kinds of pressure. Creativity in the classroom is more than making fun art projects for your students. For instance, you may be asked to teach with limited resources or in a restricted environment. Your class may also require creativity on your part to teach children from different cultures or backgrounds. You may also need to draw from your creative side to take risks and make decisions outside the norm in the best interest of your students. Of course, creativity is essential to make learning fun and exciting for your preschool class. You can everything planned out for each lesson, but great preschool teachers know that unexpected turns can happen at any time. When you remain flexible to deal with change, you can handle almost anything. This could include something as simple as having an alternative plan for rainy days or more drastic like adjusting your entire curriculum to accommodate for a reduced budget. Even the very nature of teaching young children requires constant fine tuning and dealing with minor issues. By staying flexible, you can tackle every kind of educational challenge with poise and grace. 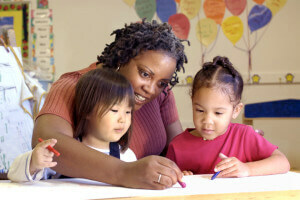 Great preschool teachers are dedicated to their students and their career. When you are determined to stand up for your beliefs on behalf of your educational values or your students’ needs, you will gain respect from your colleagues, parents and students. Moreover, excellent educators are dedicated to the love of learning and inspire their students to learn more. At the preschool level, making the classroom a place where learning is fun can resonate with children for the rest of their lives. Most of all, truly successful teachers are dedicated to bring out the best in their students. Even with these five characteristics, it is important to be part of a supportive teaching community as well. Many preschool teachers find further inspiration by belonging to professional associations such as the National Association for the Education of Young People. You can visit their website for more information. Overall, great preschool teachers continue to work on their craft as well as their own personal development to become better every year.